Sure, social media is getting a lion’s share of marketers’ attention for its ability to generate interest and engage consumers. But, it’s not the only performer out there that deserves recognition. While some marketers might scoff at the thought of using tried-and-true “guerrilla marketing” methods, it’s important to note that the promotional handout is far from dead – and consumers still use USBs. In truth, if your competitors are up-to-date on the latest innovative marketing strategies, they are already using promotional items – giving away sharp, modern custom USB replicas of their business logo or products. But, it’s important not to pigeon-hole yourself into one strategy, promotional giveaways should be used in tandem with social media and other marketing strategies. But, your competition doesn’t want you to know that. Now, you’re in on the secret: Promotional Products Work! More importantly, promotional products offer certain unique advantages. And that’s exactly what your competition doesn’t want you to know. They are a low-cost way to send a targeted message. And because they’re tech-related, you’re hitting a huge audience. Now that more consumers own smartphones, computers and laptops, custom USBs are making a comeback. Today’s USBs aren’t your mother’s USBs, either. Now, you can put a USB on a pen, business card, postcard, flyer, or a refrigerator magnet. Flash Drives can even be embedded with a microUSB connector, allowing them to be plugged into any Android device. No need for pesky QR codes interfering with your design, either. 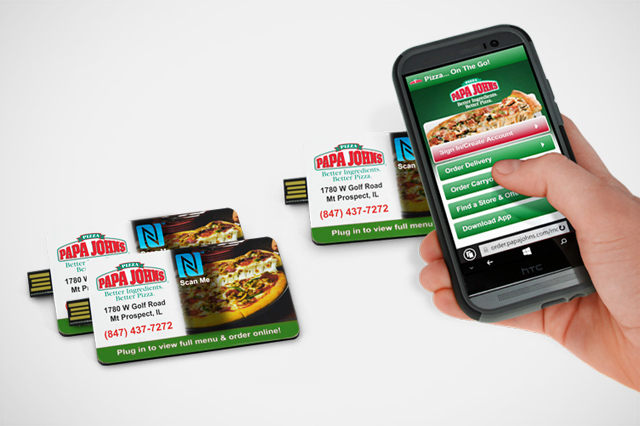 Today’s USB flash drives can be embedded with NFC (Near Field Communication) eliminating the need for a Barcode Scanner. Interestingly, promotional products can do more than, well, promote your business! You can use a custom flash drive to help your sales presentation, as a tool in training seminars, or to update business manuals and policies. It’s no secret that as USB technology improves, more information can be squeezed onto less-and-less space. Once upon a time, a paper-thin USB only had enough space to launch your Website. Today, you can fit an entire Movie Reel, Music Demo, Training Seminar, or Product Catalog onto a Smart Postcard and mail it to your clients anywhere in the world. One can argue that outside of a TV advertisement, Radio spot, or AdWords campaign, there’s nothing like a promotional product to leave a lasting impression on consumers. With a physical reminder in their hands, a USB drives home your brand message, over and over again – every time your prospect picks it up to use it, glances at it on their desk or kitchen counter, or recalls their clever, custom-crafted USB. With the endless options at your disposal for creating a custom flash drive, it’s going to be hard for you to keep this information to yourself. So, now that you know what your competition didn’t want you to know, put it into action and start thinking about how promotional products can serve your business.